About Salt | Salt International Corp.
Salt is a leading manufacturer specializing in providing comprehensive touch solutions. We have been committed to the touch panel field for over 20 years and have accumulated extensive and valuable professional knowledge and experience with respect to touch panels. 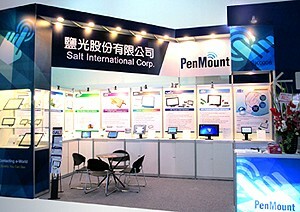 Salt’s current marketing focus is on the PenMount brand of touch controllers. Through proprietary PenMount research and development paired with an understanding of touch control market needs, PenMount can provide touch panel controller products that enhance customer offerings and satisfy market demands. At the same time, Salt also satisfies customer requirements by providing total touch panel solutions. Salt is a distributor of renowned touch panel manufacturer Apex Material Technology (AMT) and we hope to provide comprehensive customer service.